P&C firms devoted significant time and effort to improving their mobile apps in 2018. The space was an area of intense competition: several coverage group firms released new tools and features, while five—Amica, Chubb, Liberty Mutual, Nationwide and State Farm—launched brand-new apps, often with drastic structural changes. Amica introduced a new app in September with a simplified design, cleaner interface, minimalistic home screen and anchored bottom navigation menu that allows easy access to Billing, Policies, Claims and Account screens. 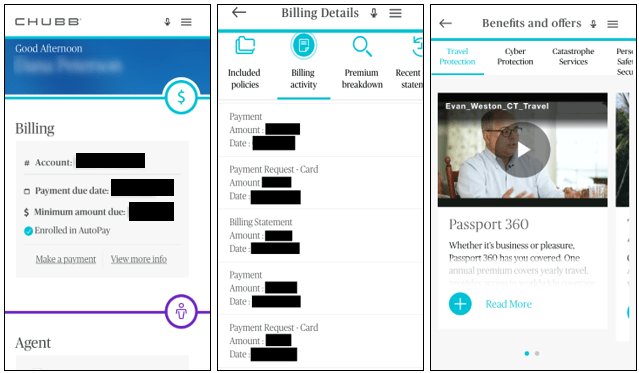 The revamped app features an omnichannel experience, as dedicated Billing and Policies screens mimic the succinct style of their private site counterparts. Also, a new Account screen replaces the previous Settings screen and allows clients to enable a Face ID login option. Chubb redesigned its mobile app in November, refreshing some design elements and adding a few key features. The home screen features a Billing tile that lists the account number, payment due date, minimum amount due and autopay enrollment status. Notably, the Billing Details screen organizes content across five intrapage tabs—Included Policies, Billing Activity, Premium Breakdown, Recent Statements and Future Payments—that provide a comprehensive breakdown of billing activity. A new Benefits & Offers section shows exclusive client services tailored to the customer’s lifestyle. 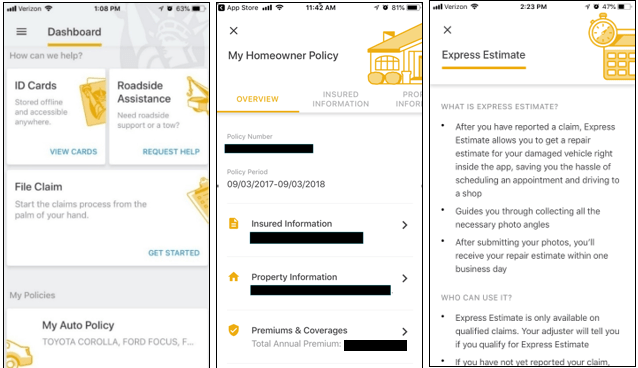 Liberty Mutual revamped its mobile app in June, introducing a significantly simplified design with a cleaner interface, improved home screen functionalities and easier access to key policy screens. 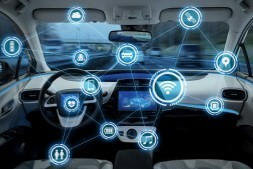 Content centers around a Dashboard screen that features tiled sections for quick access to ID cards, roadside assistance, claim filing and policy details. 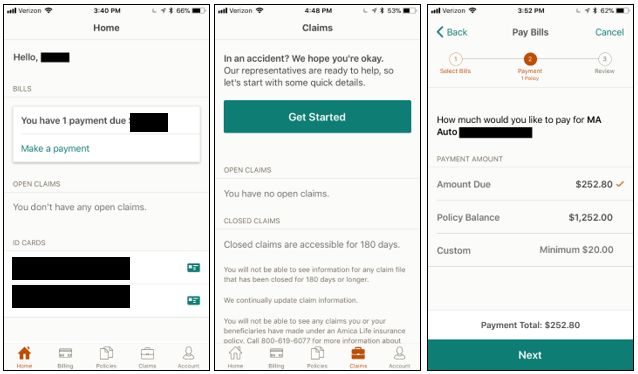 Like its predecessor, the updated mobile app features a hamburger menu, but this version emphasizes customer support by including more links to resources like roadside assistance and claims details. The policy overview screens include both horizontal and vertical tabs that enable seamless navigation between policy details. Nationwide updated its mobile app in February in conjunction with a public site homepage and navigation revamp. 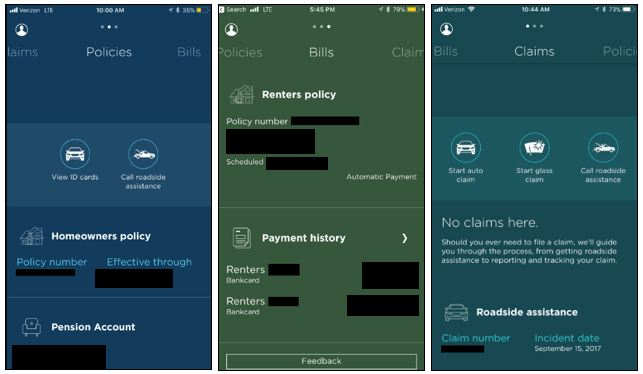 The new app boasts three differently colored scrollable screens—Policies, Bills and Claims—creating evident sectional differentiation. All content is findable from these three screens, affording seamless access to key policy, billing and claims information, as well as customer support resources. Previously, the mobile app displayed the same information but it required significantly more clicks to find. 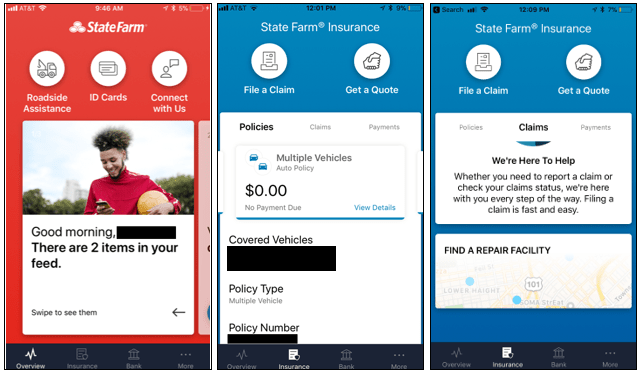 State Farm launched a new mobile app in February with a simple design and seamless navigation, consolidating all product types in one location. Like Nationwide, State Farm’s app consists of three color-themed sections that display key policy, claims and billing information; however, it also features a More screen that allows clients to update personal information and contact customer support. Notably, the app offers a chatbot, providing an interactive claim experience.